Kyoto Museum of Traditional Crafts Fureaikan is located on the basement floor of Miyako Messe, one of the largest convention centers in Kyoto. Inside this museum, they showcase 74 types of handicrafts with around 500 artifacts on display. This is the only museum showcasing this amount of handicrafts in the whole of Japan. And the specialty of this museum is that you don’t only have to be satisfied with only looking at the works. You can read about the crafts from the text panels by them, and, if you so wish to do, you can even buy them. In addition to this, you even get to see how the artisans make their crafts up close. So there are many ways in which you can enjoy this museum. I recommend this museum to those interested in handicrafts. If you’re not that into handicrafts, note that entrance to this museum is free, and it’s an easy destination to combine with Heian Shrine and Kyoto Zoo. Inside the museum, the exhibitions are divided into categories, such as Kyo-sensu, Kyo-ware, Kiyomizu-ware, and Kyo-zogan. Each one of them is explained in great detail in the text panel in front of the display. They use actual fabric and parts to explain the making of these crafts, so it’s learning more about the crafts is easy. They also have video about the artisans making the crafts. It may be even easier to understand how the crafts are done by watching the videos than reading, as the process of making the crafts is shortened into a concise video. Among the products, those with price tags on them can be bought, so if you find something you like, tell the staff which one you want to buy. At the Kyoto Museum of Traditional Crafts Fureaikan, you get to see how chosen artisans perform their crafts (chosen every month), such as warosoku (Japanese candles), Kyo-zogan, and tsuzureori (fabric weaving). It’s interesting because you get to know how the traditional crafts are made, and what is the process that has to be done in order to make one craft, and how much of a handwork is needed for it. There is no pen for the artisans, so you can go right next to them and see them work. You won’t have this kind of chance often, so I recommend going close to the artisan and looking carefully at him or her work. They don’t have live handicraft making every day so check the calendar before going. Live performance held from 10:00 am to 4:30 pm. *The live performance differs by day. Check their website. *Please note that the live performance times may change. Every Sunday from 9:30 am to 4:00 you can try yuzen. They have 35 different pictures to try, like bunnies, flowers, and the Chinese characters for Kyoto. You choose the one you like, and dye it into the cloth in the yuzen style with the color you like. Note that the price for the experience changes based on what you want to dye the picture onto, as you can choose from a handkerchief, fan, tote bag, T-shirt, and toher things. The cheapest one is the handkerchief which you get to dye for 900 yen. The dying itself is not that difficult so it can be enjoyed by children too. This would be a nice experience to remember your trip by for parents and children and groups of friends too. *Only cash. Big groups need to pay together. *You cannot bring your own products to dye. *The experience takes around 45 to 60 minutes, depending on your speed. *Group reservations are accepted for days other than Sunday too. Check their website for more information. This is a special event that will take place once a month until March 2019. Maiko and geiko (Kyoto-dialect for geisha) will dance Japanese dances on the stage and play shamisen (a Japanese three-stringed musical instrument). The beautiful dance is sure to become a nice memory of your trip. There are other highlights besides the maiko and shamisen too. It’s the beautiful kimono and hair ornaments the maiko and geiko have on them. These are made by the traditional craft artisans of Kyoto, by inheriting the time-tested techniques of their forefathers. Please also notice these things making the maiko and geiko even more beautiful. Normally maiko and geiko work in the geisha districts, so it’s rare for you to be able to see them dance and play musical instruments this close. You don’t need to make a reservation, and this is a free show, so going to the museum when they have this show is a good idea. *They also have special seats for an extra fee which also let you take a picture together with maiko. Read more on their website. ・Eating and drinking are forbidden in the museum. 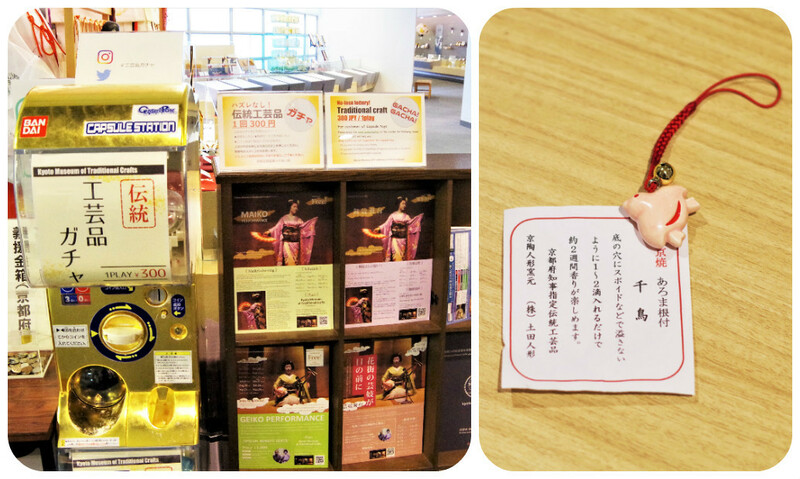 You can try your hand at handicraft Gashapon at the museum too. One try is 300 yen, and with it, you get a real handicraft from Kyoto. Like in the picture, you may get a Kyo-ware netsuke (like a cell phone strap), or you may get a mizuhiki hair ornament, but before rotating the lever, you don’t know what you’re getting! You get real handicrafts from Kyoto made by artisans for cheap, so these are also nice as souvenirs. I was surprised by how many handicrafts there were inside the museum. It was exciting to walk the corridors of the museum; you got to learn about how the handicrafts were made, and if you liked something, you could also buy it. My favorite part of this museum is that you get to actually see the artisans do their crafts! The artisans are not in a pen or anything, so you get to see them work up close. There are not many chances like this to get this close to artisans. It’s a nice chance to get to know just how delicate and skillful they are. You can also try many kinds of things here, and I’m surprised there is no entrance fee, so if you’re interested in the history of Kyoto and traditional crafts, please pay this museum a visit! Kyoto was the capital of Japan for well over a thousand years and the handicrafts of it flourished during that period. That's why the traditional crafts of Kyoto are of such quality: they have such a history behind them. Many of the items on display are also on sale here, and some of them are surprisingly cheap. So this is also a great spot to visit for those who wish to buy some quality souvenirs. Kyoto City Bus From Kyoto Station: #5, #100, get off at Okazaki-koen Bijutsukan Heian Jingu-mae. #206, get off at Higashiyama-nijo Okazaki-koen-guchi. From Shijo Kawaramachi: #5, get off at Okazaki-koen Bijutsukan Heian Jingu-mae. #32, #46, get off at Okazaki-koen Rohm Theather Kyoto Miyako Messe-mae. #31, #201, #203, get off at Higashiyama-nijo Okazaki-koen-guchi. Subway: A 10-minute walk north from subway Higashiyama Station’s exit 1. Summer holiday (August 21 and 22) and New Year’s holiday (December 29 to January 3). *Dates differ every year, these dates are for 2018. VISA, MASTER, JCB, AMEX, Diners / You can pay for the products at the museum and the museum shop with a credit card. Their homepage is in English and they have an e-book in traditional Chinese, so you can learn about traditional crafts in a fun way. English *E-book available in French, simplified, and traditional Chinese.